Disney does a nice job of rewarding annual pass holders during many of their special events. This year, if you attend the Epcot International Food and Wine Festival at least three times, you can pick a free glass tumbler. There is a special room in Innoventions East, where you go for the free offering. 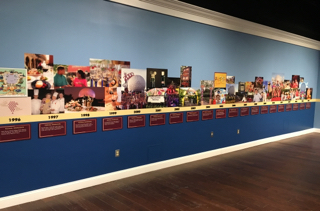 In the waiting area, they have posted a timeline and highlights of the previous 20 Food and Wine Festivals.